This is known as the “Little Planet” format. There are a number of ways to achieve this, some complicated, others not quite so. 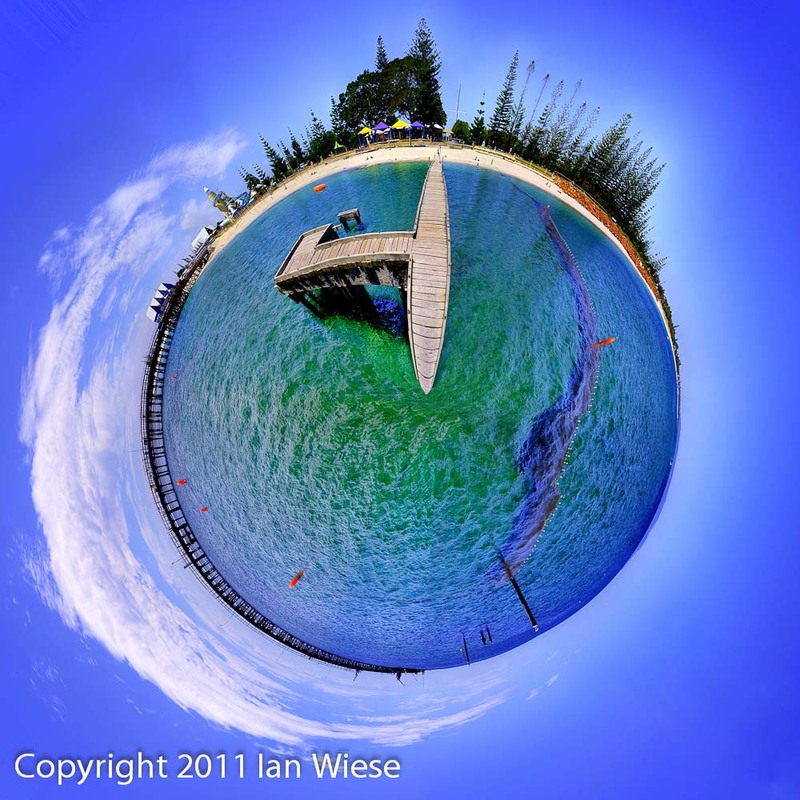 The first step is to take a 360 degree panorama. I recall this image as having 2 rows of 13 images. Each image was a blend of around 5 exposures. The resultant panorama is resized to a square format and turned upside down. Then you use the Photoshop rectangulat to polar coordinate conversion and this is the result. (If you dont turn it upside down, then the sky will wind up in the centre). This image won GeoCatch’s Bay OK competition probably because it captures many of the features of Geographe Bay – the jetty, the Busselton Foreshore, the swimming platform, the water, and on the right you can see the coast to Cape Naturaliste (probably not on the screen, but the full size image shows it). I was playing around with this technique when GeoCatch announced their competion. There were some very, very good entries but they generally showed one feature of the bay. This entry was posted on March 1, 2011 by ianwiese. It was filed under Geographe Bay, Landscape and was tagged with Bay OK, Busselton Jetty, Geocatch, Geographe Bay. There are some great examples of this style on the net. I am looking forward to seeing the images you got on True North.